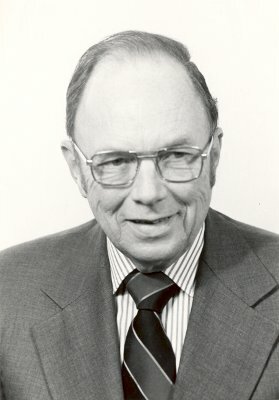 John V. N. Granger, IEEE President, 1970, founded the Airbone Systems Laboratory, which researched and developed antennas, microwave components and systems, and aircraft navigation among other things. Dr. John Granger's childhood interest in radios and electronics led to his pioneering career in radio engineering. He obtained his B.A. in mathematics and physics from Cornell College and his Ph.D. in applied physics from Harvard University. To some degree, his graduate work was disrupted by World War II. Granger worked at Harvard's Cruft Laboratory and began specializing in antennas. In 1942 he taught pre-radar school at Harvard and then transferred to the radio Research Lab. In 1944 he traveled to England as a technical observer for the NDRC Division 15 with the U. S. Forces in Europe. In that capacity he worked in the American-British Laboratory and helped develop technology used in the Normandy Invasion. Granger received his Ph.D. in 1948 and went to work at the Stanford Research Institute, where he formed the Airborne Systems Laboratory. He also became the assistant director of engineering research and was directly responsible for research and development in areas such as antennas, microwave components and systems, advance communications techniques, aircraft navigation, and weapons systems planning and evaluation. His own research was concentrated on aircraft antennas, especially antennas that would produce minimal aerodynamic drag. In 1956 Granger formed Granger Associates, which specialized in commercial applications of technology and made many innovations in antennas and aviation-related products. Some of his products became standard equipment on all jet aircraft made in the United States. As a result if this success, two subsidiaries were formed, Granger Associates Ltd. , England, and Granger Associates Ltd., Australia. Granger retired from his company and found himself unsure how to proceed in his career. David Packard and Frederick Terman passed along his name to the State Department and Granger began advising the U.S. government on technological and scientific matters in 1971. He served as deputy director of the State Department's Bureau of International Science and Technology under the Nixon Administration. Subsequently he worked for the National Science Foundation and became the U.S. Counselor of Embassy for Science and Technology in Great Britain. Granger also worked for a time in UNESCO. In a later interview, he noted that he had very much enjoyed his work with the State Department. He was an active member of IEEE since 1954 and served as IEEE's president in 1970. He wrote a book on politics and technology as well as many papers on aircraft antennas and airborne communications. He also received many honors and awards. After retiring in 1983, he moved with wife, Jill to the Cotswolds area of England. He continued to wrote in his retirement, producing , amongst other things, several children’s stories. Granger was married to Jill Frances. He also had a daughter and two sons. He passed away in England in 1997. This page was last edited on 1 February 2016, at 16:44.